This beautiful Tiger cigar lighter and matching cutter set comes together and makes a perfect gift. 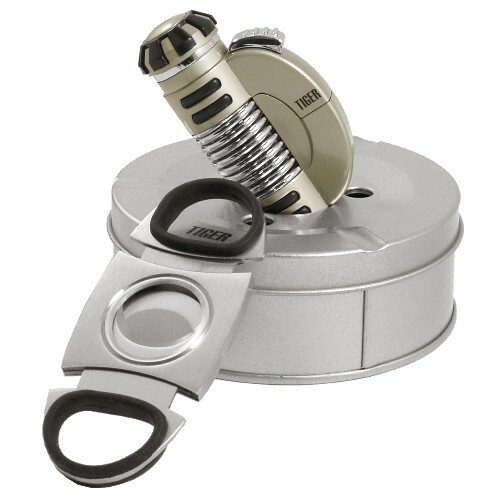 This set includes a Tiger space gunmetal wind resistant cigar lighter and also includes a double guillotine brushed stainless steel cigar cutter. Backed by a one year warranty. Cigar cutter -- 3.25" x 1.5"
We do not recommend the purchase of lighters as your country may not allow them to pass through customs. It is up to you to know your countries policies: we are not responsible if lighters are confiscated. We will ship without fuel as is required.